From gardening tools to electrical appliances, from cleaning brooms and mops to door locks and handles, from screws and bolts to trowels and saws, Fix It seems to have it all. The latest and perhaps the most innovative to date among a series of hardware stores owned by a known name in the business, Fix It could hardly be confined to the definition of our traditional hardware store. Usually, hardware stores such as those in Old Dhaka are reputed to have things you can't find anywhere else. One store has something and another has something else, so one has to move from store to store to acquire everything one needs. The philosophy behind this new store seems to be to break that tradition and introduce a single place where you can find everything one might need. Offering a wide range of gardening, electrical, household and construction tools, furniture fittings, etc, 36 categories of items in all, including stationary and sanitary fittings, they provide variations of each item that come in different prices, such as trowels made in Bangladesh as well as trowels made in Thailand. This way, the same item is made available to all classes of people. Fix It and stores like it stand as appropriate responses to changing times, in which both spouses work in more and more families and need the handy gadgets to save time and increase efficiency in running the household by themselves. So, good news, all you people who need to get your screw drivers and spray starch and don't want to go to the ends of the world to find it all. Located right next to the Gulshan Agora, the store is hard to miss. The management seems to be constantly adding to their collection of items from home and abroad and there is something new in the place almost every week. The question is, are they as likely to be able to hold on to the quality of their products and their assured availability, or will it be lost in the search for diversification? All us gadget freaks and independent working women can only hope that it won't. They are as lovely and delicate to look at as hairpins, and you don't necessarily need long hair to wear them. Stone punch clips can add grace to both long and short hair, and can be worn with shalwar kameezes as well as sarees. Stone punch clips come in different shapes and sizes, and in attractive colours. The stone work with its delicate filigree designs come in forms of petite aqua-blue butterflies, or rose coloured flowers and leaves, and so on. The cost of these stone punch-clips range from Tk 400 to Tk 2000 depending on its size and the craftwork. You will find tasteful ones at Navana Tower in Gulshan 1. For all those men and women who wear watches not only because they tell us the time, but also because they are a neat fashion accessory, look no further. These will range from funky looking and/or sporty, to sophisticated, and come in both thick and thin strap leather belts and platinum buckles. For leather belt lovers, you are not limited to brown, beige or burgundy. You can either choose from expensive brand names or buy regular ones, and the best part is both looks tasteful. You can find a wide selection of these trendy looking wristwatches on the first floor shops of Iqbal Tower, and the prices will vary depending on quality and brand name. Are you an avid fan of Bangla sci-fi? If yes, then you can purchase the collections of Md. Zafar Iqbal's engrossing science fictions. Available in three volumes, each set contains a compilation of some of the best works of this eminent Bangladeshi writer. Each collection will cost you tk.275, and are available in most of the popular bookstores of the capital. They are not only comfortable and healthy to wear, but very voguish as well. If you are looking for something fancy, you can get especially lovely beaded and sequined ones in shops at Navana Tower, and prices range from about Tk 700 to Tk 4000 depending on craft and quality. Simpler yet smart leather sandals with belts and straps, or without, are also available in different colours and designs at Navana Tower and other big shopping malls in the city. These are actually candle stands that look like small table lamps. They add elegance and class to any décor, whether it is placed on a niche in the living room or on your bedside table. The lampshades are made of silk or satin cloth. They include two-tone shades, matte gold, shocking pink, and so on, and are designed with sequins and beads. You can find this selection of candle stands on the third or fourth floor at Navana Tower, Gulshan 1, and these will cost you around Tk 3000. Want to prettify your brow with a beautiful bindi and add grace to your look? Well, the idea's not that bad; Bangladeshi girls and women do love to adorn their forehead with colourful, eye-catching bindis when they are clad in gorgeous saris and salwar kameezs. Almas Super Shop at Gulshan sells purely elegant Richie Rich bindis. Available in nice wooden boxes, each set contains multi-coloured bindis. Embellished with stones and beads, these bindis are worth purchasing while planning for a stunning make over. Prices of Richie Rich bindis will vary by intricacy of designs. Each set will cost you between tk.410 and tk.450. You can also check out Shoppers World for stylish bindis. Besides, the shops at Gausia Market also retail fashionable Indian bindis with wonderful work of stones, crystals and beads. Glitter is back and the matte look is almost out. A dash of glitter to your eyes gives you a glamourous, sensual look. C&F is a German product, and the glitter eye shadows are powder based. Some of the more attractive shades include deep bronze, matte gold, sheer lavender and turquoise blue. 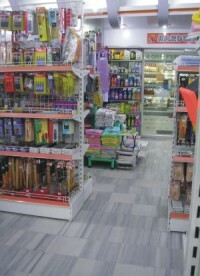 These products are widely available in many of the stores at Metro Shopping Mall, Rifles Square and others. A C&F glitter eye shadow will cost you around Tk 150. Shab-e-barat is just around the corner. Exchanging halwas and other Shab-e-barat item amongst family friends and relatives is a popular custom in Bangladesh. It's a short trip if you deliver the halwas to a neighbour's house. But if you intend to send the halwas to a distance, safe packing is very important. Make sure the box is airtight. Before packing, always be sure to wash your hands properly. Make sure the surface and inside of the box is clean and dry. It will prevent germs from spreading quickly. When you are travelling to the relative's house, be sure not to expose the container to the sun or moisture. After the end of the day there is always some halwas left. Or you might simply want to store some to savour later. It is also important that you store it with care. A clean and dry box is also necessary this time. Before placing in the freezer, wrap the box with aluminium foil or plastic wrappers. Do not keep any strong scented elements such as onions, spices, or fish around the box. There is a possibility the odour might ruin the aroma of the delicacy. Do not fluctuate the temperature of the freezer often. Do not store the halwas for too long. Extended storage may cause flavours to change and reduce nutritional value. After storing any food item the quality may change. If you take the container out of the freezer quite often it will perish sooner. When you do take the box out make sure not to expose it to any sources of moisture, heat and light. Excess heat and moisture may cause the halwas to group together and lose taste. To minimise food quality losses eat the food soon after storing. usually the halwas that you get from your relatives or neighbours make a huge pile and it is also full of varieties. It is not always eaten instantly. The day moves in a real hurry. What to do with them is a dilemma. Just stash the titbits in the freezer. After a day or two when you are free you can do a little experiment with the treat and make a wonderful new dish. Blend all the halwas with milk and ghee. Add more ghee on a pan, heat it and put the blended halwa to cook. Add sugar if necessary. Keep the pan on the stove and stir the halwas softly till it turns in to another brand new halwa. Its an experimental idea but the best option is to give it to your maid, ask her to properly freeze it so that she can carry it to her village home for her family there later. is not about savouring halwas and roti. Shab-e-barat is about sharing. Keep this in mind on the day of the holy event.